Patient came in to see Dr. Lisa Bunin about repairing her torn earlobe. Dr. Bunin sees many patients who have earlobe damage. 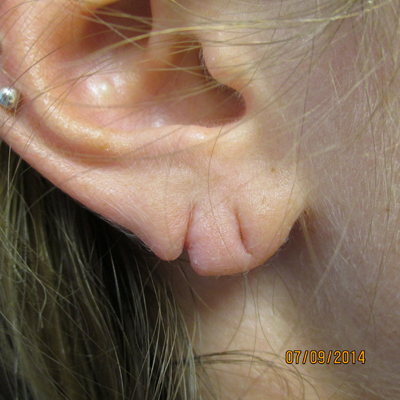 This shows the earlobe after Dr. Bunin did the repair. You can see there is hardly any scar. 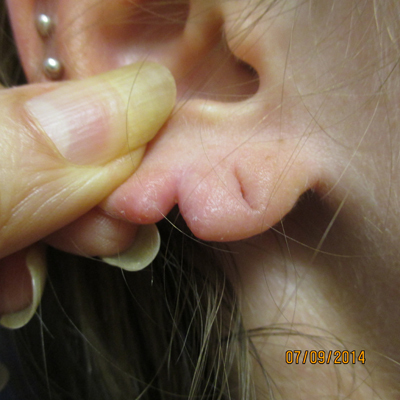 After about 8 weeks the patient could have her earlobe re-pierced. View additional before and after photographs. Earlobes serve women and men as popular locations for jewelry. Often, the earlobes are pierced to fit various forms of ear ornaments ranging from little studs to larger and heavier items. Many people experience damage to their earlobes mostly due to wearing heavy pierced ear rings over many years and eventually gravity takes its toll. Others get an ear ring caught on something and the ear ring pulls through the skin. This tear or split may be unattractive and renders the earlobe unusable for most jewelry. How Can the Tear Be Corrected? Most torn earlobes can be effectively and safely corrected using delicate surgical repair techniques. Dr. Lisa Bunin performs the surgery in her office located in Allentown, PA. After planning and marking, a small amount of lidocaine numbing solution is deposited. The procedure itself is performed without any discomfort. In order to rebuild the earlobe, the healed and scarred aspects of the tear require removal. Repair is then performed in a straight line or in a zigzag. The most appropriate technique will be discussed with the patient and depend on the specific location of injury and anatomy of the earlobe. Fine suture threads are used, support the repair and minimize scaring. Small amounts of antibiotic ointment are applied at home for a few days ensuring cleanliness. 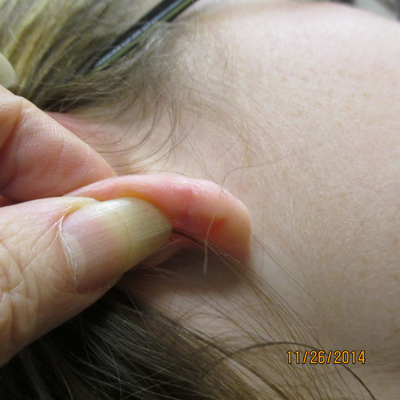 Once the earlobe is healed, there is barely visible pencil-fine scar line without aesthetic limitations. 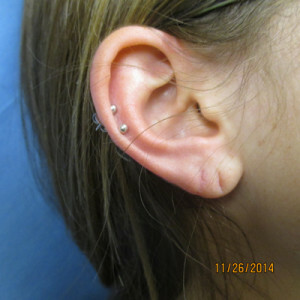 After the earlobe has healed, the patient can have the earlobe re-pierced. Many patients experience decrease in the fullness of their earlobes as they age or they may experience sagging. It seems the earlobe is no different than other facial areas that decrease in volume due to aging. Sagging earlobes and stretched out piercings can actually be improved with dermal filler injections. Dr. Bunin is an expert injector of dermal fillers and can tailor an injectable treatment plan specifically to your needs to firm up and reshape the ears. Dr. Bunin often uses a small amount of Radiesse® to add back volume to the earlobe.